The world of business and marketing is filled with good books, and few people have time to read all of them. If you haven’t read it yet, make sure that Youtility by Jay Baer has a place on your list. Youtility was published in 2013 – it’s taken me two years. (My bad!) It’s relevant and important today. I don’t want you to suffer the same fate and miss this gem, in case you haven’t read it yet. Here are five things I love about the book. Choosing a good book title is tough. 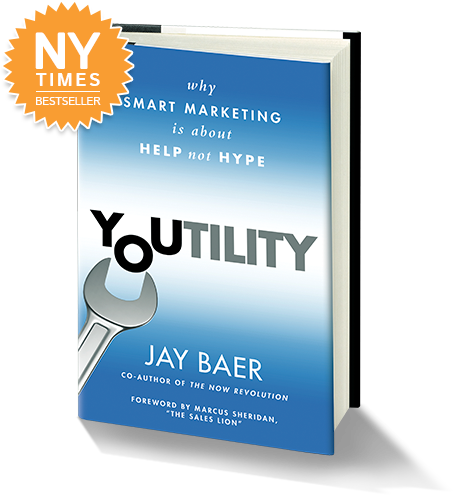 The single word Youtility encapsulates the meaning of the book and Baer’s approach to marketing, combining utility with a focus on the customer or audience. Make it your mantra and you’ll go far. Building community, establishing trust, offering value – these are the skills of masterful marketers today. 3- The examples are fresh and interesting. The third part of the book covers the three facets of youtility: self-service, radical transparency, and real-time relevancy. The book illustrates each with interesting and fresh examples. Baer has gone out of his way to find varied examples, from giant B2B endeavors to the guy reviewing frozen food. It’s worth reading the book for the RunPee application story alone. The examples make the point that these strategies are not just the domain of the large business, nor the guerilla tactics of the startups or small businesses. Youtility is a great leveler. 4- It’s fun to read. This is what business books should feel like when you read them – entertaining and absorbing at once. At one point, Baer describes a character with this: “You want to have a beer with Dan Florio.” On reading this book, I want to have a beer with Jay Baer. 5- The message is relevant and timely. The key reason to read this book is that it matters to marketers of all types today. In the subscription marketing context, the concepts also apply when you’re nurturing value for existing customers. By focusing on being helpful and practicing Youtility, marketers add value outside the solutions they sell. This is one of the key tenets of value nurturing for sustained customer relationships. I sometimes receive an affiliate commission for books I recommend through Amazon. I only recommend books I admire.